The life of Kenneth Patchen could almost be the archetype of what we all grew up thinking of as the struggling artist. Poverty, ill health, obscurity, and misunderstanding saved late in the day by the deus ex machina: a grant from the Arts Foundation. What’s more, he appears to have been a bit cantankerous, too. All in all, Patchen’s life was just what one would expect that of a poet of his generation. Over the course of his, at times, difficult life Kenneth Patchen wrote more than 40 volumes of poetry, prose, and drama, starting with Before the Brave, published by Random House in 1936. This was followed in 1939 by First Will and Testament, and then in 1941 by The Journal of Albion Moonlight and But Even So: Picture Poems in 1968. Patchen was also interested in working alongside other artists who worked in a variety of media, and in experimenting with multimedia himself. He created the radio play The City Wears a Slouch Hat, broadcast in 1942, with the composer John Cage; and in 1957 he performed with the Chamber Jazz Sextet, often suggesting in his letters that he was the first person to perform poetry to jazz music. He is perhaps best known for blending visual arts with his poet’s voice, creating painted poems throughout his career. The Selected Correspondence of Kenneth Patchen is a wonderful glimpse into the life of this highly regarded and talented artist. On more than one level, the letters included here are a fascinating insight into the trials and triumphs of Patchen’s life. We get an account of his life as a young man struggling through the depression; we get to experience the difficulties of dealing with a painful ongoing lifelong disability; and we are able to follow the artistic development of a wonderfully challenging poet. Not only are we privy to Patchen’s life, we also get to peek into the minds of some of preeminent writers and publishers of the day. Included here are letters from Henry Miller, a life-long Patchen supporter; Kenneth Rexroth; Dylan Thomas; Lawrence Ferlinghetti; e e cummings; and other literary luminaries. The Selected Correspondence of Kenneth Patchen is truly a valuable record of the extent to which artists sometimes need to close ranks and support each other, whether financially or emotionally. There is very little editorial input into this record. The voice we hear is generally Patchen’s, sometimes his wife Miriam’s, or else it’s one of his many correspondents. That means what we get is a picture of Patchen’s life with very few filters, only his own. That being said, it seems as though Patchen has very well developed ideas about the world and how it works, ideas that are perhaps not shared by the wider population. He was an ardent pacifist and strongly against U.S. participation in World War II. In that sense The Selected Correspondence of Kenneth Patchen does its job very well. This is not a sanitized account of an artist, underrated during his own lifetime. It is not a romanticized view of what it was to be a poet and an artist who influenced the Beats, although ultimately rejecting them as attention seekers, who continued a long tradition of blending literature with visual arts. No, this is a personal account, a timeline that charts a life more full of heartbreaking difficulty than it was of triumph. It is indeed a fascinating read. In fact the only criticism that can be made of The Selected Correspondence of Kenneth Patchen is in its construction rather than its content. The pages are too heavily styled and detract from the wonderful letters. There is no need for the heavy black footer lines or the overblown headers. They constrict the copy and give each page a feeling of enclosure rather than freedom. Perhaps this is a deliberate visual trick designed to reflect the life of Patchen; regardless, it is distracting. Likewise, the use of copies of handwritten letters is a laudable idea that doesn’t always come off. While seeing the handwriting and spelling foibles of the correspondents is a great way to get into the heads of the writers, too often these letters are difficult to read and interfere with the reader’s flow. In some cases a typeset version of the letter is displayed along with the handwritten original—an approach that should perhaps have been use throughout. 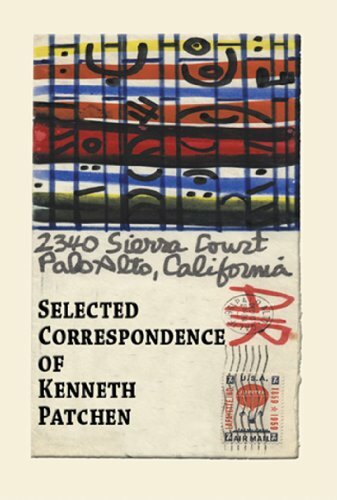 Overall The Selected Correspondence of Kenneth Patchen is a very good resource for all those interested in the development of poetry originating in the U.S.
Patchen is one of the key figures in the history of American poetry and as such fully deserves this well-chosen record of his life and achievements. Phil Constable is a technical writer, document designer, and editor who has written on such authors as John Fowles, Graham Swift, William Golding, Graham Greene, and Kazuo Ishiguro.